Our energy networks are among the most reliable in the world and we will ensure they remain so in the future. Thanks to efficient management and economies of scale, we are keeping the existing networks affordable. We also want to further increase the comfort our customers experience when we are carrying out work on their behalf. Because the trust of our customers is important, both to performance our traditional daily work and to realise our new network ambitions. Customers want a reliable and safe infrastructure. We are investing heavily to continue guaranteeing the robustness of our network. In 2015, we spent about €700 million on the maintenance, replacement and construction of our energy infrastructure. In the reporting year we completed our most important planned projects. Dilemma: how long must we continue building gas networks? Every year we invest tens of millions of euros in the replacement and construction of gas networks. Looking at the trends and developments in the energy market, we foresee a more sustainable future with a falling demand for gas. Home insulation is improving, new-build housing is increasingly energy-neutral and electric heating (with e.g. heat pumps) is also gaining ground in new residential projects. Though we expect the use of gas to decrease, we still build new gas networks at our customers' request. Also for new-build neighbourhoods and projects. The construction of energy networks is a long-term investment for us, based on an estimated useful life of 40 to 50 years. If the Netherlands wants to be climate neutral by 2050, the gas networks must be replaced with alternative heating solutions within the next 35 years. Hence our question: how long and where must we still build gas distribution networks? Our network investments are tailored to the specific needs and characteristics of each region. The Alliander Year Plan gives a region-by-region overview of our investments in the energy networks. Owing to lower-than-expected customer demand and overly ambitious project timelines, the investments were lower than planned in 2015. Investments in maintenance are designed to maintain and improve the reliability of our energy supply. In 2015, customers were without electricity for 21.9 minutes (2014: 19.9 minutes) on average. We thus achieved our target (<22 minutes). In addition, the number of postcode areas with more than five interruptions per year was 10, well below our target (maximum of 17). In the reporting year, we were confronted with a high-profile interruption in the electricity network. On 27 March, Noord-Holland and a small part of Flevoland were hit by a massive power outage. The cause was a short-circuit at a high-voltage station of TenneT in Diemen. The Liander area was the epicentre of the outage. According to the Association of Energy Network Operators in the Netherlands (Netbeheer Nederland), it was the biggest power outage in Dutch history, leaving one million customers without electricity for part of the day and causing severe disruption to daily life. The consequences of this major incident underlined the strong dependence of our customers on electricity. Many smaller daily interruptions are caused by excavation work. To minimise the risk of excavation-related incidents, we provide detailed information on the location of our underground cables and pipes. We are also replacing obsolete parts of the network. And whenever interruptions occur, our engineers are ready 24/7 to remedy the fault as quickly as possible. New digital applications in the networks are increasingly enabling us to fix faults faster, and sometimes from a distance. One example is the ‘Smart Cable Guard’, which can prevent interruptions by detecting dormant defects in underground cables. This enables repairs at an early stage. The system makes it possible to reduce the number of power outages by 25%. This innovation was successfully tested in the networks in 2015 and will be applied more widely in the coming years. One unique event in 2015 concerned an interruption in Lochem. During a stress test at this location, we put the maximum load on the network, which resulted in an interruption. This joint initiative of Liander, the University of Twente and LochemEnergie was the first power supply stress test of its kind in the Netherlands. Such tests are vital, because the demand for electricity is expected to continue growing, particularly in view of the advance of electric driving and the intensifying use of electric household appliances and solar panels. For these reasons, the electricity network will have to cope with much larger loads than today. The average outage duration of the gas network in 2015 was 241 seconds per customer. This was largely caused by two major gas interruptions in Velsen and Oldebroek. On Thursday, 15 January, a gas mains in Velsen-Noord was damaged during works. The gas network was flooded with water and mud, leaving 1,150 households without gas. It took until Wednesday, 21 January, before all homes were reconnected to the gas network. In Oldebroek about 300 households found themselves without gas on Wednesday morning, 29 July. The gas interruption, which lasted two days, was caused by water and mud getting into the gas mains. Including the major interruption of 2014 in Apeldoorn, we have been confronted with three major gas interruptions involving a combination of gas and water mains breakages within one and a half years. In 2015, we teamed up with Vitens to reduce the risk of gas faults arising from burst water mains through the proactive replacement of gas and water mains in Apeldoorn. This operation comprises the replacement of 46 kilometres of water and gas mains in total. The work started in 2015 and will continue through 2017. During major events our contribution is crucial, though not always visible. Organisers of such events often call upon our experience. One example is the large national sailing event SAIL 2015, which required extensive prior preparations. Our work included installing traffic control systems along the busy routes to and from the event and setting up communication lines between the Liander crisis control team and the Amsterdam-Amstelland Regional Safety Authority. We also liaised closely with the local emergency services. The network operators are tasked with providing energy transportation, connection and metering services. As this is an exclusive statutory task, the tariffs are regulated and the Netherlands Authority for Consumers & Markets (ACM) sets the permitted tariff level for the individual network operators. 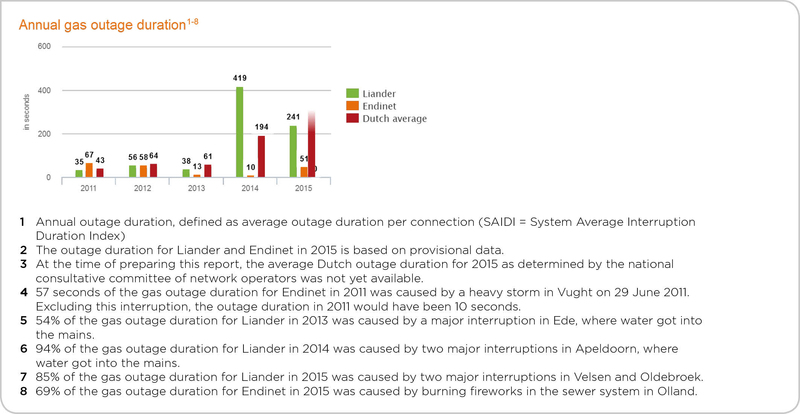 The network operation tariffs for Liander in 2015 were comparable with those in the previous year. The tariffs would have been lower if they had not been taxed with sharply higher regional sufferance tax levies. The costs of sufferance tax - the municipal levy that Liander is charged for using publicly-owned land - continue to increase. These local levies generically increase the tariffs for all customers, even though sufferance tax is only levied by a limited number of municipalities. The sufferance tax paid in 2015 amounted to €110 million (2014: €80 million), working out at €37 per customer. This tax will be passed on in the tariffs in the coming years. Alliander finds sufferance tax undesirable for two reasons. First of all, customers pay more tax without being aware of this because it is paid through their energy bill. Secondly, customers of municipalities that do not levy sufferance tax help to fund the budget of other municipalities. Late in 2015, the Dutch House of Representatives requested Minister Plasterk (Interior Affairs) to produce a legislative proposal for the abolition of sufferance tax as soon as possible. Customer satisfaction is one of our most important objectives. Our direct contact with consumers and small business users has changed over the past years. Since the introduction of the statutory supplier model in 2013, the energy supplier has become the first point of contact for questions about the energy bill and meter readings. Network operators are still the first point of contact for questions about connections, interruptions or energy network maintenance. We are seeing that customers are not yet always sure who is responsible for answering their questions. We are working to make it as clear as possible for customers whom they must contact. Our customer satisfaction rating among consumers was 95% (103% versus the network operator benchmark), comparable with the score in 2014. Our satisfaction rating in the business market was 86% (95% versus the network operator benchmark), which was higher than in the previous year. The customer satisfaction is largely determined by the reliability of the energy supply. Clearly, customers want a service that lives up to the demands of our modern era. They expect energy to be available 24/7. We find every contact with the customer important, including during the execution of our work. In 2015, we introduced a mobile centre to provide local residents with direct and personal information during prolonged interruptions. This mobile centre has already proved its usefulness, notably during the major gas interruption in Velsen. In addition, we are increasingly expanding our online services. After the launch of the renewed Liander website in December 2014, further improvements were made last year to further enhance customer convenience. The Customer Effort Score rose to 73 in 2015 (year-end 2014: 59), notably thanks to the quality of the control information. The peaks in the visit to Liander.nl are caused by major interruptions. On average, the website attracts about 20,000 visitors a week. Encouragingly, Liander.nl came out tops in a benchmark survey comparing the large network operators on 8 key subjects. One aspect that was further improved in 2015 is the provision of information on interruptions. We now give more timely, correct and complete information. Last year, the number of unique business partners making use of the MijnLiander environment for large business users jumped 89% (from 4,590 at year-end 2014 to 8,677 in December 2015). This went hand in hand with a rising number of customer actions performed within MijnLiander, including digital billing. Finally, in 2015 we also launched an entirely renewed Public Lighting Portal for municipalities and contractors (almost 600 users), which is suitable for tablet and smartphone. This renewed Public Lighting Portal is faster and more user-friendly.